Curb appeal is so important. 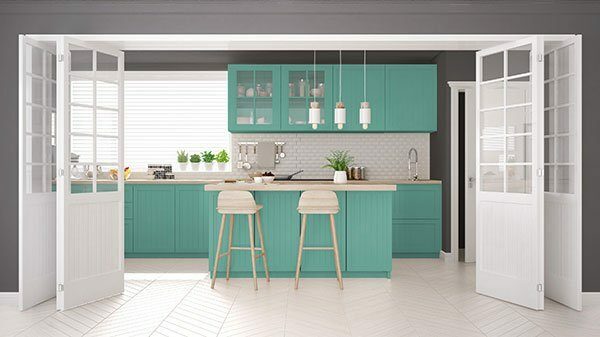 Did you know that most people judge what your house looks like on the inside by how it looks on the outside? 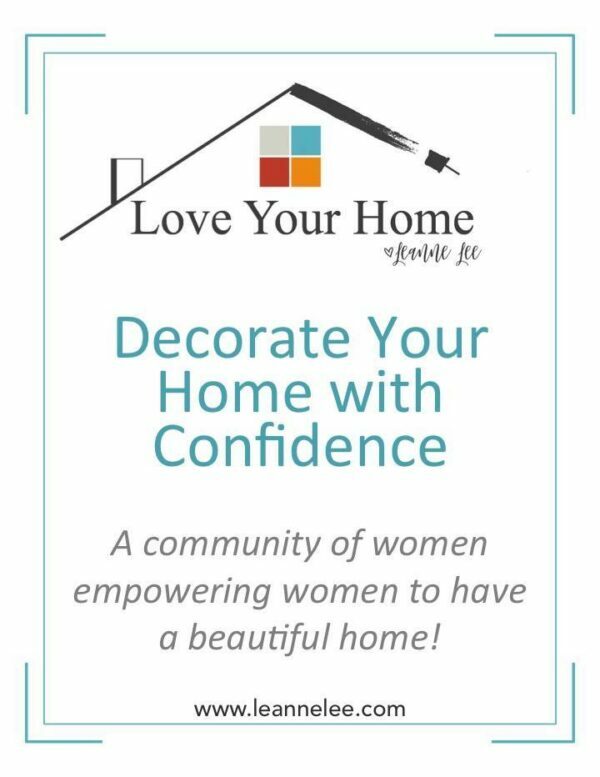 And seriously, who wants to drive up to an unappealing house or look out your windows at an ugly yard? 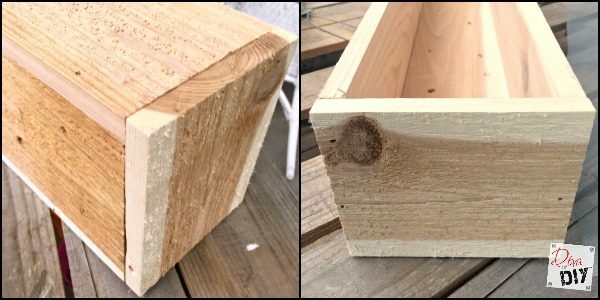 So up your curb appeal or back yard character with these quick and easy cedar window boxes! Sealer (Make sure your sealer has some pigment like this one to keep your wood from turning gray). Tools- Saw , Nail gun , drill and bit. Step 1) Measure the length of your window. 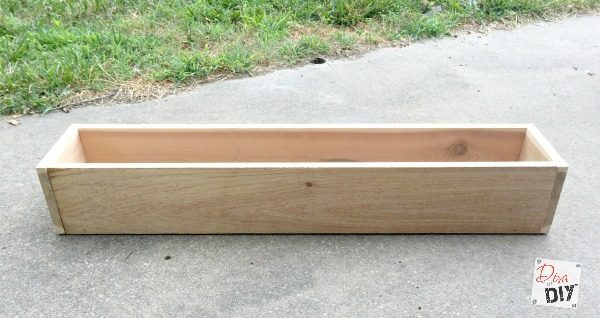 Most window boxes are the same length as the window but you can make them shorter or longer depending on the look you like. 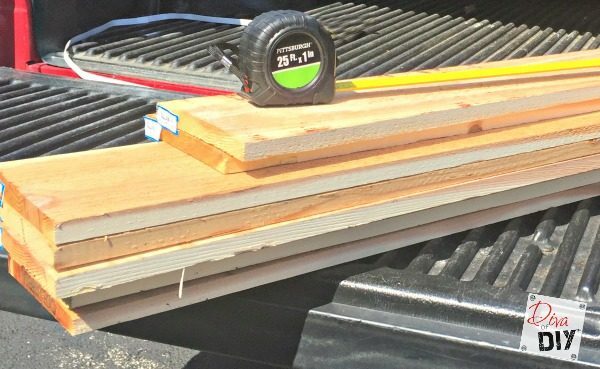 Step 2) Cut 3 boards for the bottom and two sides the length you want your box to be minus 1 1/2 inches (the width of your two end boards). Step 3) Cut 2 boards 5 1/2 x 6 1/4 these are your end pieces. Your end pieces dimensions won’t change unless you decide to make your window boxes deeper. *Diva Tip: 1×6 boards are actually 5 1/2 x 3/4. Yes I know, it’s crazy but true! Step 4) Attach the bottom board to the two side boards as shown above. I used my finish nailer to easily attach the boards together. Step 5) Attach the two small end boards to each end. Now you have your box! 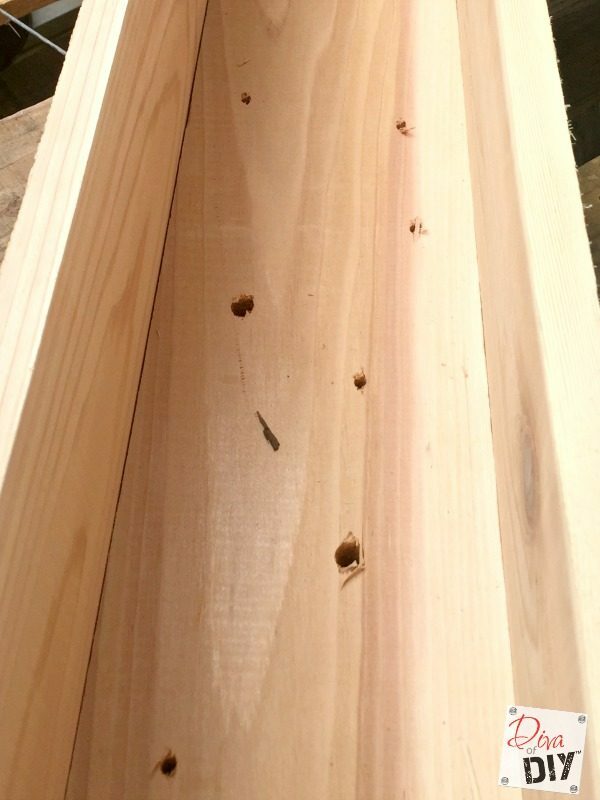 Step 6) Turn your box over and drill several holes in the bottom of the box for drainage. Step 6) Cut screen to fit and lay it inside the box over the holes. This will keep the soil in, while allowing the water to dry. *Diva Tip: The screen helps to keep your window boxes as light as possible. Using gravel only adds unnecessary weight. 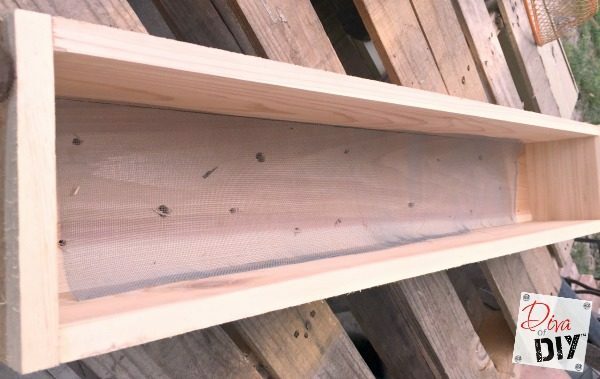 Cedar is perfect for a project like this because it holds up well outdoors. The bad thing about cedar is that it turns color as it ages. Using products made for coloring and preserving decks is the easiest way to keep your window boxes looking good! There are several ways to mount your boxes. It depends on what you are mounting your box too. Just keep in mind the weight of your boxes. 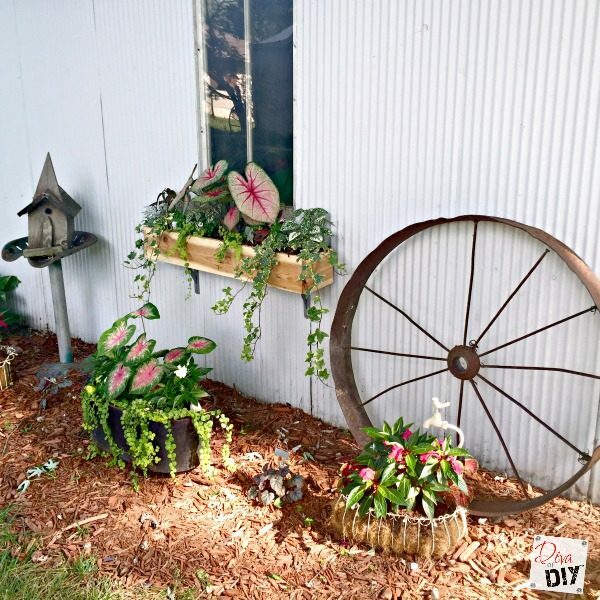 I mounted mine on a tin shed so I chose to use heavy duty shelf brackets screwed in with galvanized screws. Here are the steps I took since I was mounting to tin. Step 1) Mark the top of where you want you bracket. 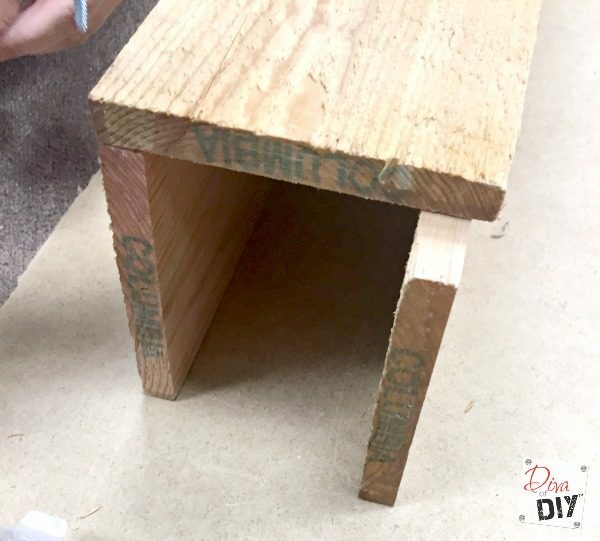 Measure the height of your box and use that measurement to measure down from the bottom of your window. Step 2) Holding your bracket at the top mark, place your pen in the screw holes to mark where the screws will be. Step 3) Drill through the tin with a small drill bit at the marks. 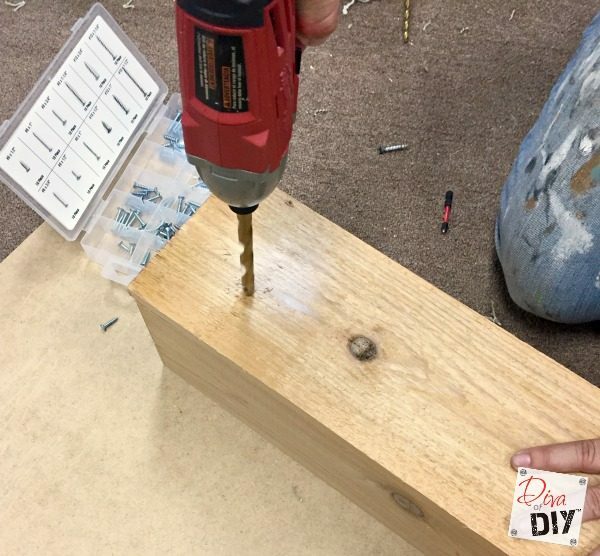 Step 4) Put your bracket back up and drill your screws in to secure the bracket. Step 5) Repeat the process for the other bracket making sure to use a level to keep the brackets level for your box. Step 6) Screw you box onto the brackets using the top bracket holes. I wanted to plant my box and be able to take it off so I screwed mine in from underneath. Just keep that in mind if you decide to screw your box on from the top (I would not recommend this method). 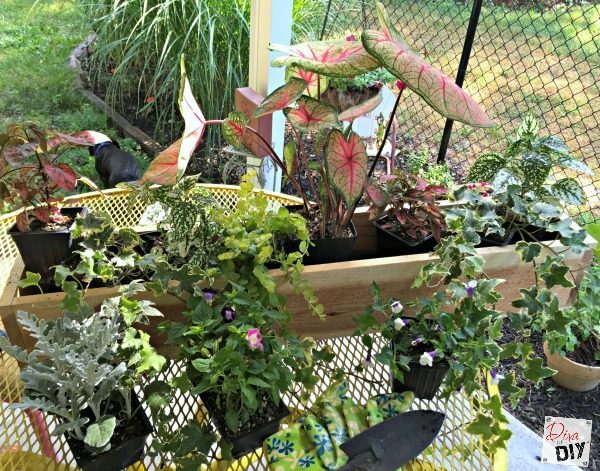 Head to your local outdoor nursery and purchase plants for the sun level your box will be in. 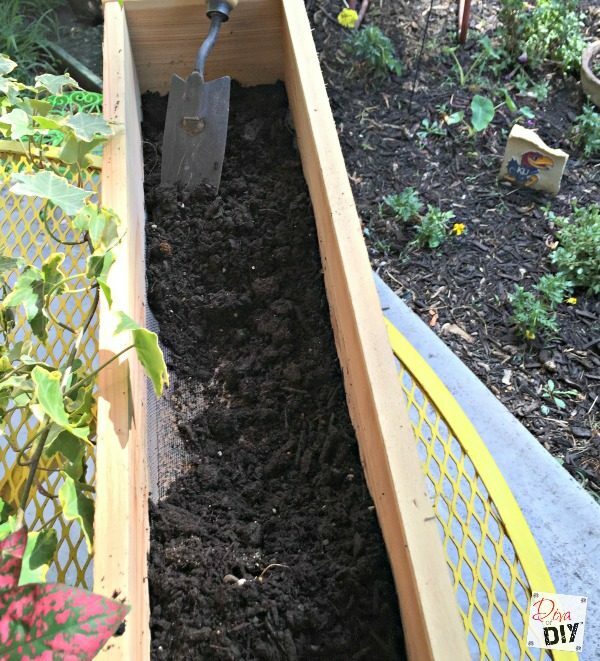 Add a layer of soil to the bottom of your box. 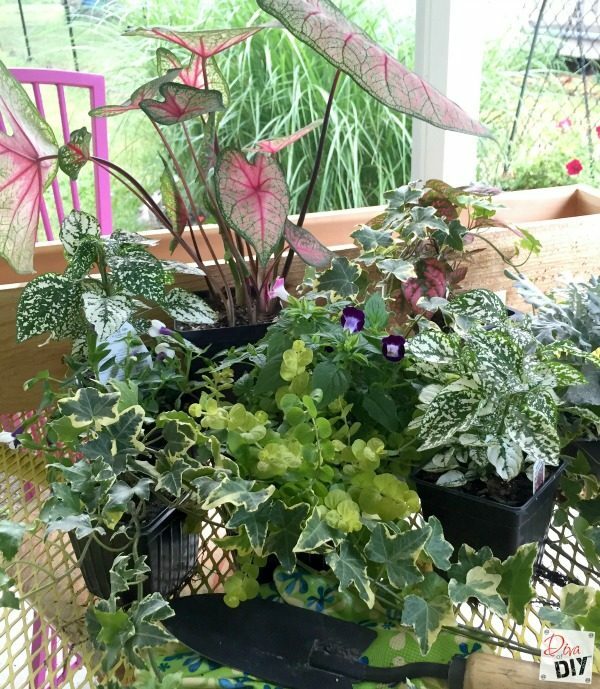 Use a good quality flower planter soil because you will need to water your boxes often and this soil will help keep your plants moist while providing slow release fertilizer. 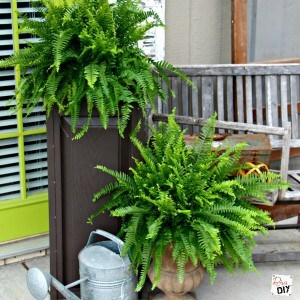 Set your large and trailing plants in and then add the filler flowers. 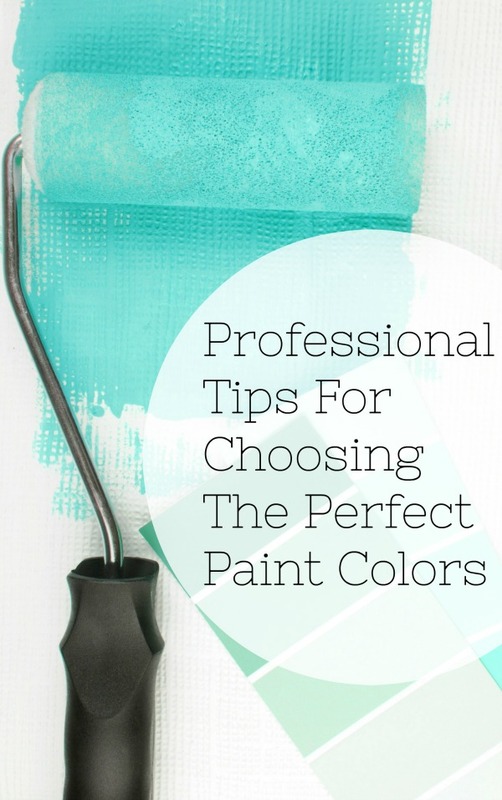 Take your time and play around with them until you find the perfect combination! When you are happy with your layout start with the plants in the middle, adding soil and flowers as you go out to the corners of your box. Place your box on your brackets and attach it! Now stand back and marvel at your work and enjoy! I am thinking I may add a fairy garden next! The evolution of the little tin potting shed… I’ll let you decide the level of change the window box made! 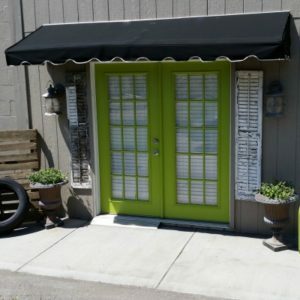 Looking for other curb appeal ideas? 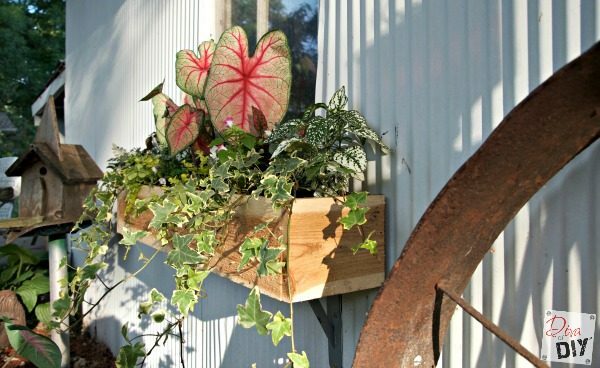 Why not add cedar board and batten shutters or one of these 10 outdoor projects! Thanks! He should! 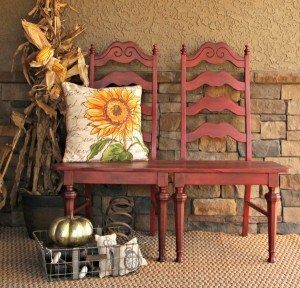 They are easy to make and really bump up the curb appeal! Do it Mr. lifeonpealstreet! Thanks Sam! I love you partying with you gals at Waste Not Wednesday! Fabulous boxes! You can substitute used dryer sheets for the screen. I have found that they are better then screen at holding your soil in but allow. The water to escape. An added bonus is that they are repurposed instead of going to the landfill! What a great idea! I hadn't thought of that. I'll have to try it this spring!